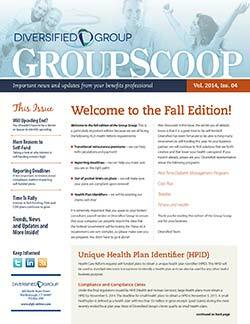 Welcome to Diversified Group’s Fall GroupScoop! Transitional reinsurance premiums – we can help with calculations and payment! Reporting deadlines – we can help you make sure you are on the right path! Out of pocket limits on plans – we will make sure your plans are compliant upon renewal! Health Plan Identifiers – we will be assisting our clients with this! It is extremely important that you speak to your broker/consultant, payroll vendor or Diversified Group to ensure that your company can properly report the data that the Federal Government will be looking for. These ACA requirements are very complex, so please make sure you are prepared. You don’t have to go it alone! Thank you for reading this edition of the Group Scoop and for your business. ← Is Your Organization Encouraging Wellness?